Since its inception in 1992, the Brentano String Quartet has appeared throughout the world to popular and critical acclaim. 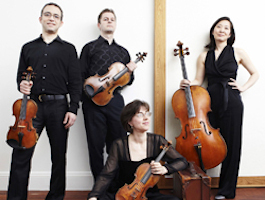 Beginning in July, 2014, the Brentano Quartet succeeded the Tokyo Quartet as Artists in Residence at Yale University, departing from their fourteen-year residency at Princeton University. The Quartet is named for Antonie Brentano, whom many scholars consider to be Beethoven’s “Immortal Beloved,” the intended recipient of his famous love confession.